There is only 3 simple steps to bake one of Betty Crocker's cake mixes. 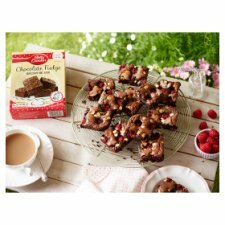 With Betty Crocker cake mixes, you can bake perfect cakes, brownies and cookies everytime. Chocolate, vanilla, carrot cake, brownies: they just taste like heaven! With Betty you can bake perfect brownies every time. The perfect treat for chocolate-lovers everywhere, these Chocolate Fudge Brownies are gently crispy on top and gorgeously gooey inside... total heaven! So grab your apron and mixing bowl and fire up your oven to 180ºC (160ºC for fan assisted ovens)/ Gas Mark 4 - let's bake up a batch! 1 Mix the egg, water, oil and brownie mix together until well blended. (Mixture may be lumpy). 2 Spread the mixture evenly into the lightly greased square tin. 3 Bake in the centre of the oven for 20-25 minutes or until a rounded knife inserted 5cm (2") from edge of tin comes out almost clean. Allow to cool before cutting into slices and having a delicious slice yourself.....mmm! Swirl half of a cup of peanut butter into the mix to create eye-catching swirls and a fabulous flavour combination. Sensational!